We are sometimes called upon by our hosted dialer customers to investigate why a campaign has not gone as well as expected. There are various factors which may influence the effectiveness including the message, the quality of the list and its relevance to the target audience of your message. However we are mainly concerned with the technical reasons as to why a campaign may not have been as successful as previous campaigns of a similar nature. For these statistics to be of best use, note should be taken of key statistics around your campaign so you can easily spot when something is not normal. When a list is does not perform as well as previous lists, the first suspect is often the carrier. We have added new reporting to help diagnose issues and to quickly identify problems. The main statistic that all carriers use is ASR – Answer Seize Ratio – this is the ratio of answered calls compared to the total number of calls attempted. 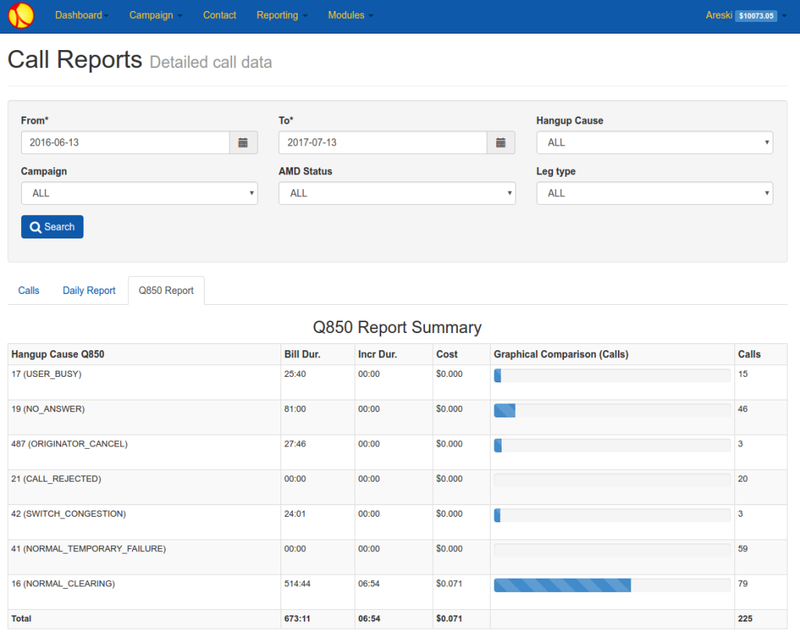 Some calls will have failed for normal reasons, such as the call is engaged or simply not answered, but others may indicate a problem with the list or carrier, for instance a call may be rejected because of carrier congestion or simply because the number did not exist Our new Q850 Report shows calls grouped by hang-up cause and can be filtered by campaign. 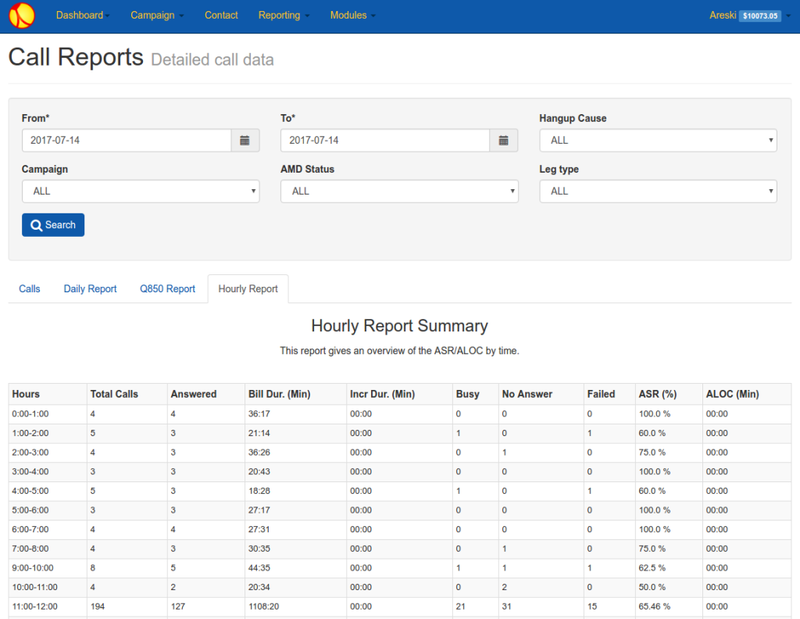 We have also added an hourly report summary showing the ASR report hour by hour. This is useful data for the marketeer using our hosted dialer, as it shows when the most people answer their calls, and it also shows if there is there is a sudden drop off of answered calls, which may suggest that there is an upstream problem. Although the reports previously described may look normal with plenty of answered calls, DTMF responses may be lower than usual. After checking that there are not an excessively high number of answering machine detections, the ratio between opt-outs and successful leads should be checked as well as the ratio of total key presses to person-answered calls. A high ratio of opt-outs to successful leads might indicate that you are not reaching your target audience and that you should consult your list provider. A severe reduction in the ratio of key presses to person-answered calls might suggest that either your message is not getting through or keys are being pressed but Newfies-Dialer is not hearing the responses. Not all upstream carriers support reverse DTMF. Having eliminated variables such as problems with the list and determined that the problem lies with the carrier and not with the hosted dialer, we need to get into more detail as to where the problem lies. A tool that we find invaluable is pcapsipdump installed on the Newfies-Dialer system. This will provide a packet trace of all SIP and RTP activity, one file per SIP exchange, named by date, time, origin, destination and call ID. This can be downloaded and opened in Wireshark, a free and open source packet analyser for Windows, Mac and Linux. Wireshark can give you the SIP flow of the call, show whether DTMF has been received, and both sides of the audio can be heard so you can check for quality. The pcapsipdump file for a sample call can also be sent to your carrier as evidence that something is amiss, as well as to assist them to diagnose the fault. The Newfies-Dialer team will assist you with working through any issues and problems which may arise and can work with your carriers so that you can concentrate on using Newfies-Dialer to generate leads for your business rather than on the technical issues. Contact us for a live demo of Newfies-Dialer or contact us to discuss your requirements.